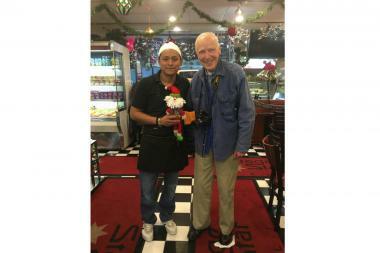 Bill Cunningham and Stage Star Deli manager Andre Garcia pose for photograph in December 2015. MIDTOWN — The staff at Stage Star Deli won’t make breakfast for their favorite customer ever again. When New York Times fashion photographer Bill Cunningham died on Saturday, he left behind an enormous portfolio of work and a mourning staff at Stage Star Deli who thought of him as family. Cunningham was a staple of the New York Times “Sunday Style” section with a quick eye for spotting trends and a real admiration for beauty. For more than a decade, the staff at Stage Star Deli would watch for Cunningham to bike down West 55th Street off Avenue of the Americas in order to get an early start on his breakfast: a small oatmeal with fruit, scrambled eggs, toast and a cup of coffee. Until he died June 25 after a stroke, Cunningham seldom missed a day. “It was raining, snowing, hot, he always came,” Lopez said. Once Cunningham didn’t come in for his breakfast for two weeks during a vacation and Stage Star Deli manager Andre Garcia, 35, worried the entire time. Cunningham shook the manager’s hand every Monday morning, smiled and spoke to each staff member, and threw away his own garbage. Garcia admired Cunningham's consideration. Once Garcia asked why Cunningham always returned to Stage Star Deli. Yolanda Valerio, 32, an employee for the past six years, said she loved Cunningham’s cheerfulness. Every Christmas Cunningham gathered the staff for a group photograph, which he would later present to them as a gift. “That’s how he was, pulling everybody together,” said Valerio, who acknowledged the 2015 photograph she held in her hand was probably the last.